Once the owners of a builder’s contemporary settled into their new urban retreat, they discovered the out-of-doors did not match up to their intriguing contemporary art collection. 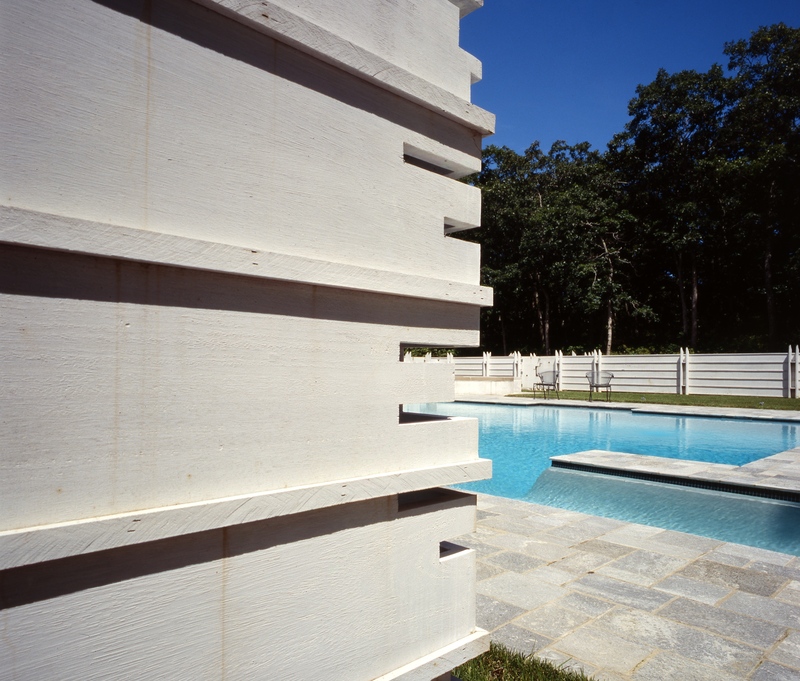 In the woodsy seaside Village of East Hampton, George Ranalli Architect undertook the job to transform the outside for a pool and poolhouse pavilion. The process began by filling in a slope at the back, establishing an earth-berm surrounded by mature trees and grassy ruffs of wild flowers. 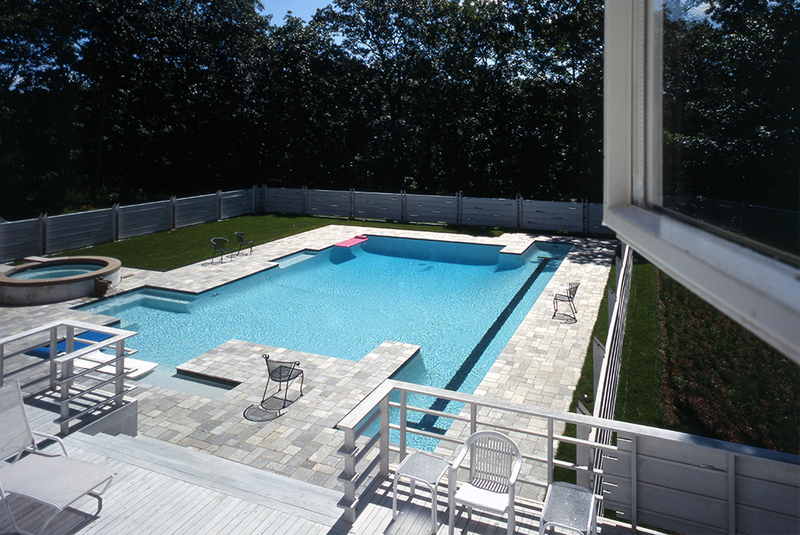 The pool house set on top includes a full bathroom and wardrobe space. Its rooftop captures natural sunlight through whimsical copper capped skylights. Its outdoor kitchen and patio sets up the area for dining and entertaining, and conceals equipment and photography dark room below. 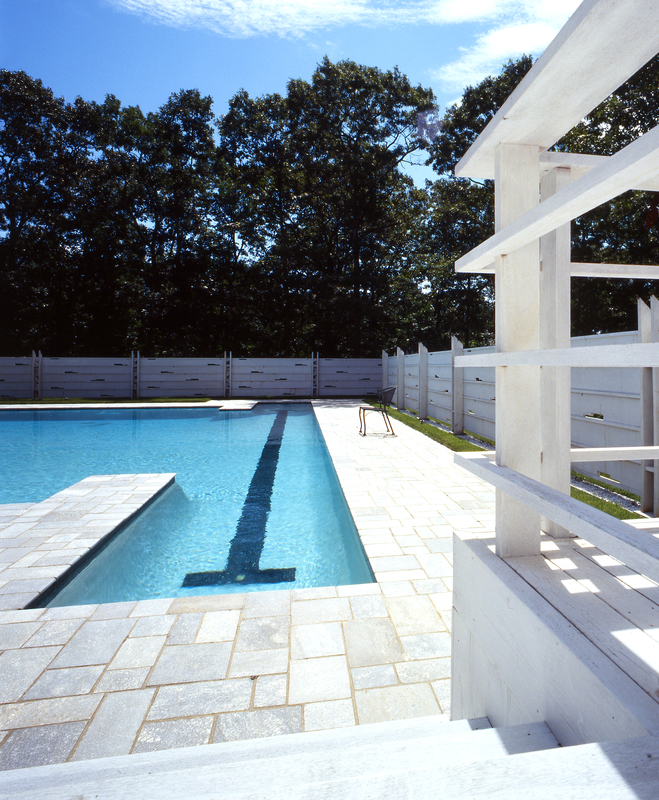 Poolhouse and fence are unified in horizontal boards and battens of whitewashed mahogany, with watery copper accents. Natural slate patio the colors of the inside of a seashell surround the pool and a low circular soaking tub, edged in limestone, spilling a gentle waterfall. 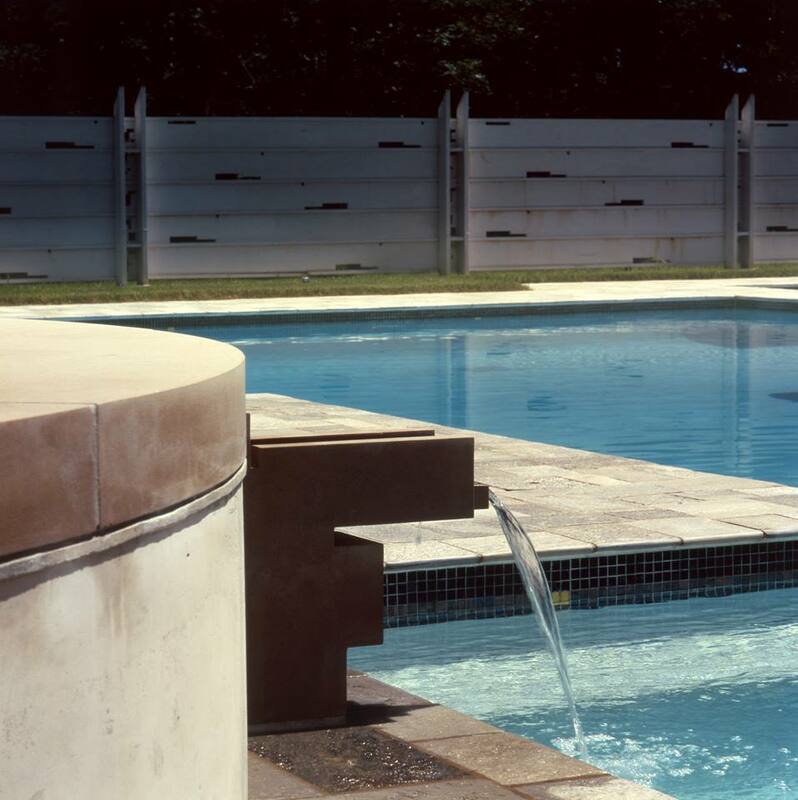 The pool is designed in various depths to accommodate a “lap lane,” diving, and lounging on wide “cocktail” steps. 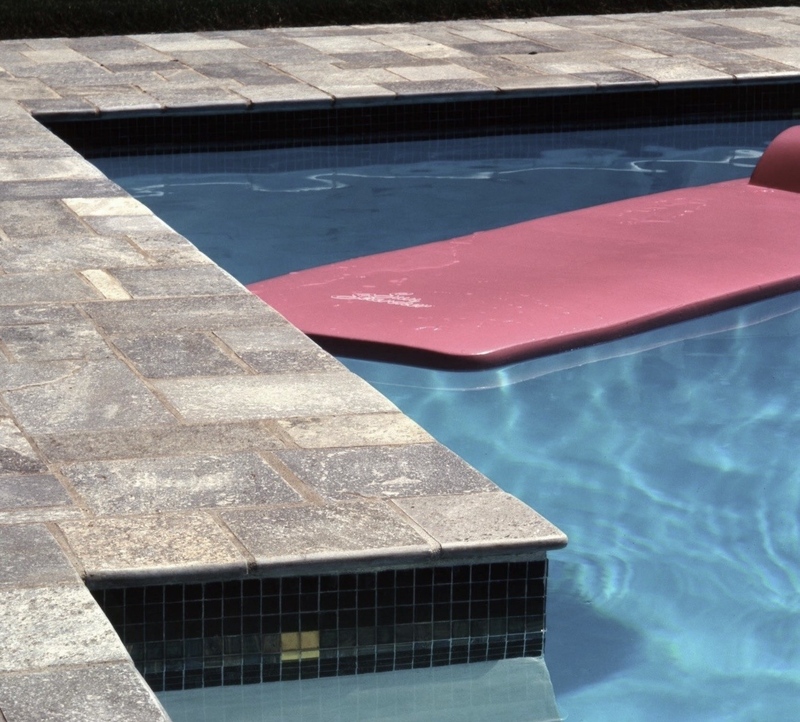 Underwater seating is designed to make it easier for young children and the elderly to get in and out. Around the perimeter, Italian mosaic glass tile glisten. 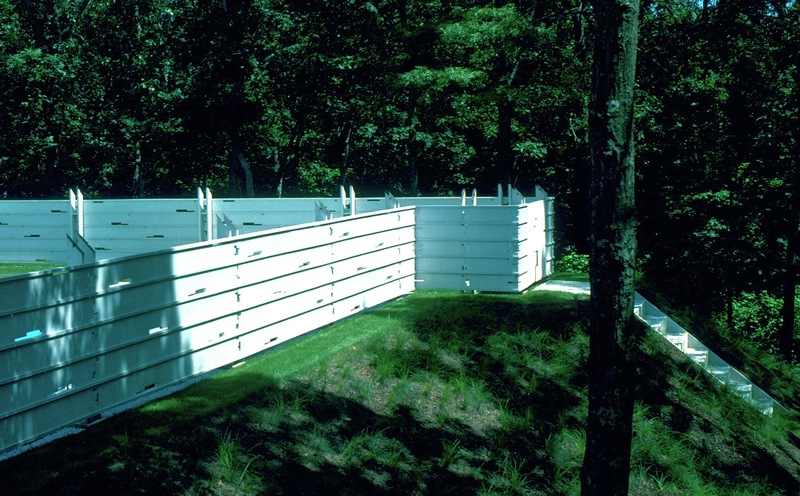 Landscape architecture creates a footpath system connecting the house to the pool and poo house and sculpture garden installations throughout the property. From bedroom windows, homeowners and their guests look out onto the project’s beautiful views.